I have been working with Electronic Artist Kuutana on several projects. This song I wrote feeling inspired by elements in my own life. I thought about asking him to work with me on it, and he really did a fantastic job bringing in many elements to the song. 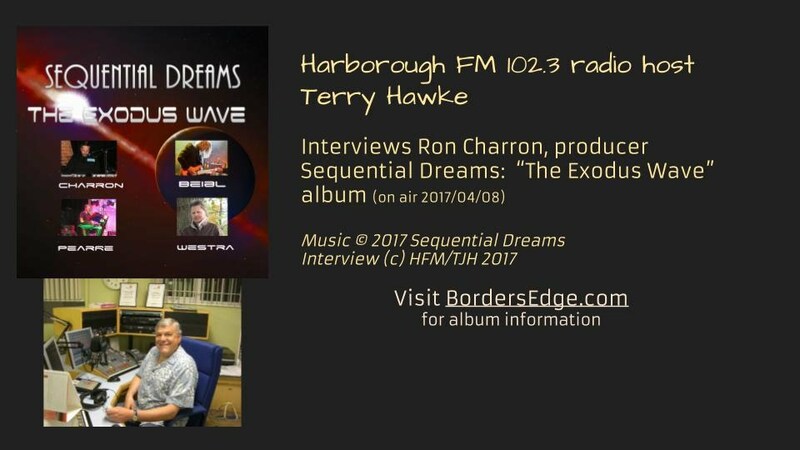 Harborough FM in the UK's radio show host Terry James Hawke upon a pre-release audition of the upcoming Sequential Dreams "Metamorphic Waves"
Metamorphic Waves by Sequential Dreams is the next all-new material album of classic era TD-style synths, sequences, and guitars. 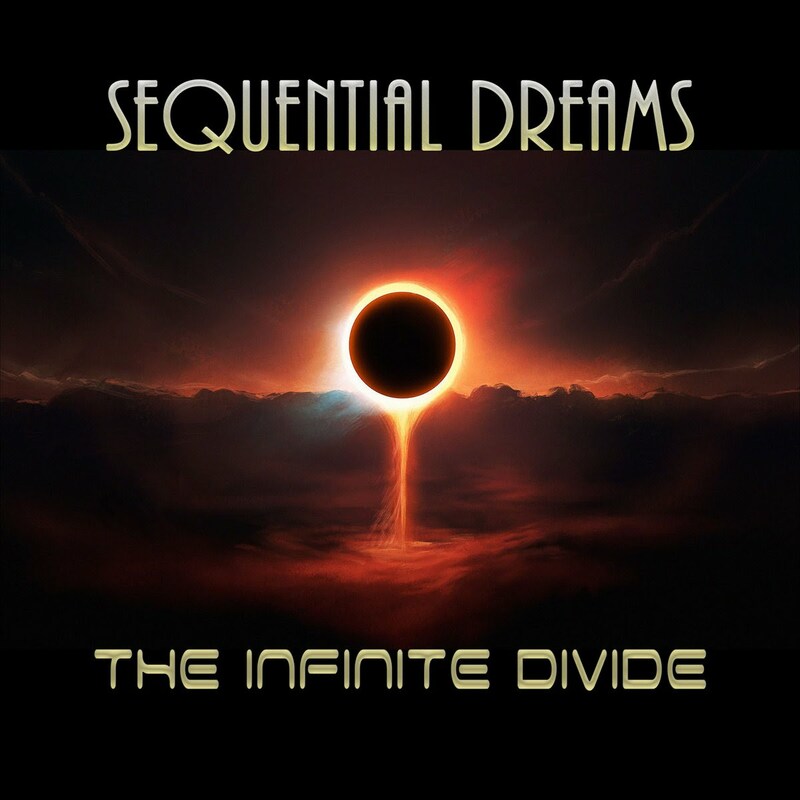 This album is a personal project by Sequential Dreams founder Ron Charron, who composed, performed, mixed and mastered all tracks on the album. 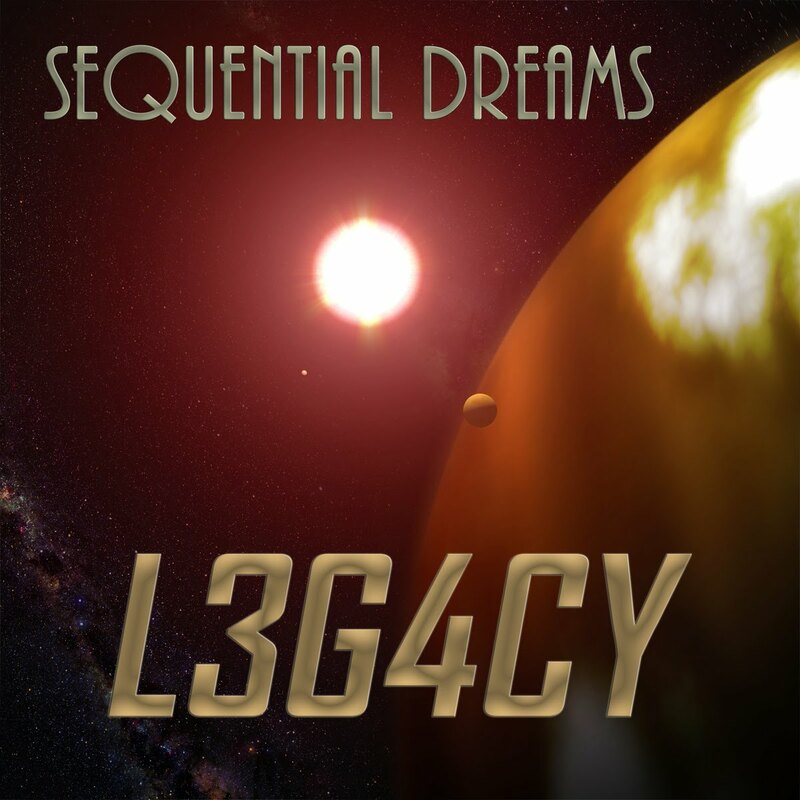 Like the Sequential Dreams page on Facebook for updates. Classic Synthesizer and Sequencer instrumental music with shades of underlying prog rock in a Berlin-School influence base. A must for fans of the classic-era TD style music! During the late 70s and early 80s, there was a time when the use of synthesizers helped to create a new kind of music. For some artists and bands, these new sounds were a way to widen the sonic palette as applied to styles such as progressive rock and also give birth to such styles as ambient and soundscape music. Certainly, synthesizers were adopted by many film score producers as a vehicle of choice for creating a rich musical backdrop to enhance the mood or drama in scenes. One such band, out of Germany, became a reference in this area. The band was called Tangerine Dream. Of course, the 80s turned into the 90s, and then the 2000’s and beyond. However those early days are when the synthesizer and sequencer driven music stood out so clearly from what have ever been produced before. 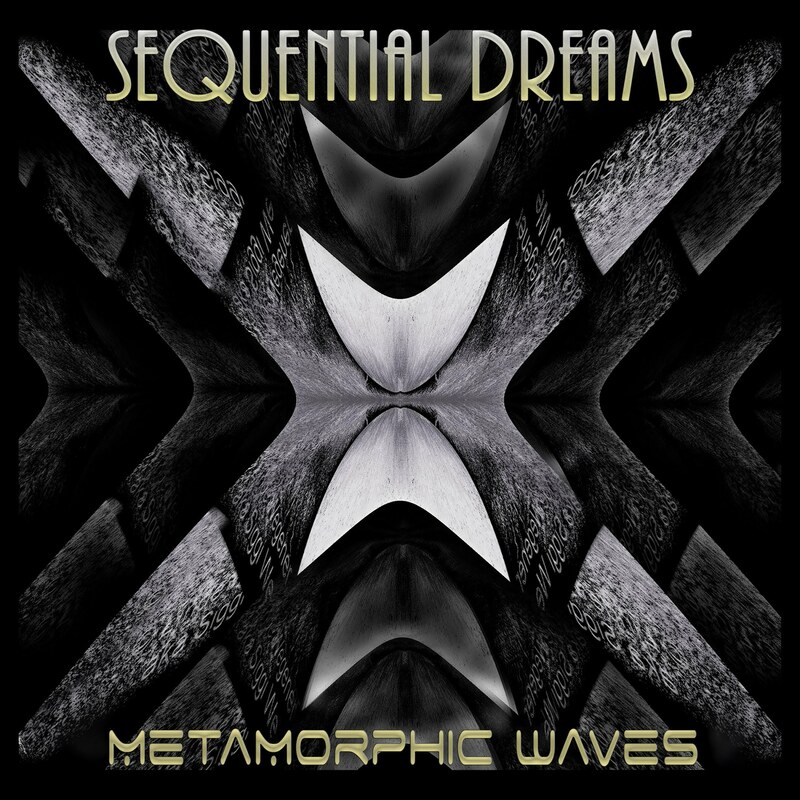 Metamorphic Waves, this album, takes its influences from what some call the “classic age” of Synthesizer/Sequencer music. 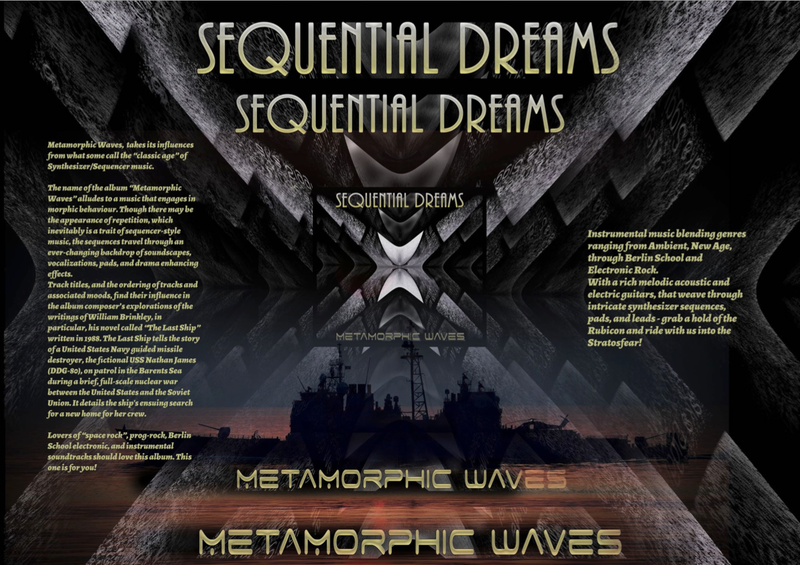 The name of the album “Metamorphic Waves” alludes to a music that engages in morphic behaviour. Though there may be the appearance of repetition, which inevitably is a trait of sequencer-style music, the sequences travel through an ever-changing backdrop of soundscapes, vocalizations, pads, and drama enhancing effects. Track titles, and the ordering of tracks and associated moods, find their influence in the album composer’s explorations of the writings of William Brinkley, in particular, his novel called “The Last Ship” written in 1988. The Last Ship tells the story of a United States Navy guided missile destroyer, the fictional USS Nathan James (DDG-80), on patrol in the Barents Sea during a brief, full-scale nuclear war between the United States and the Soviet Union. It details the ship's ensuing search for a new home for her crew. Lovers of “space rock”, prog-rock, Berlin School electronic, and instrumental soundtracks should love this album. This one is for you! Closing Words: Make Peace, not War. Save lives, don't take them. The Last Ship theme is about survival of the human race. Let's not make the mistakes described in the William Brinkley novel. We owe it to our children, and their children. Get The Limited-Availability CD Now! Listen to a few tracks NOW! Sequences#116 starts with tracks "The Last Ship" and "Antarctica Base" of the Metamorphic Waves album. Composite image above, by Mick Garlick, show host of Sequences Magazine. 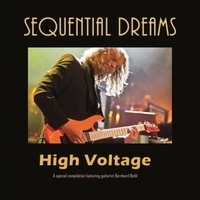 This Sequential Dreams special compilation album features a selection of Electronic Rock tracks featuring the "High Voltage" contributions of guitarist and violinist Bernhard Beibl. 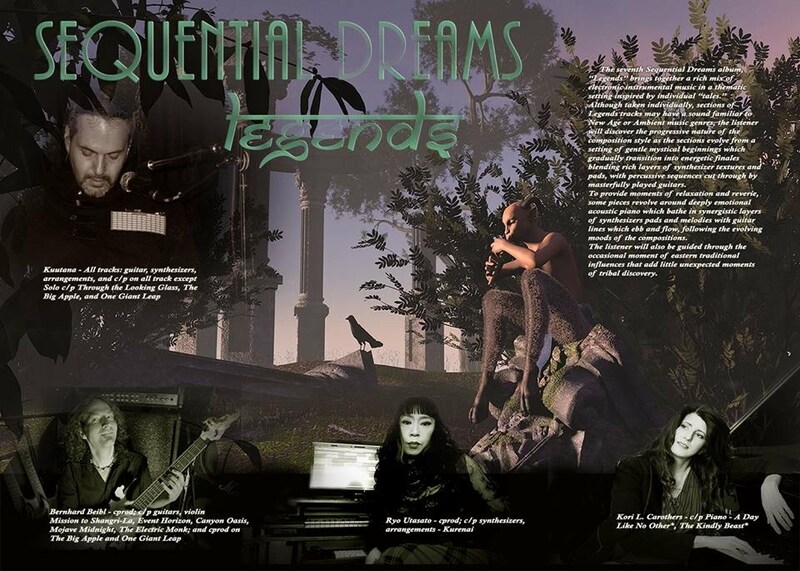 Guitarist and Violinist on Sequential Dreams projects 2016 and 2017. Visit berhardbeibl.com for news and information. 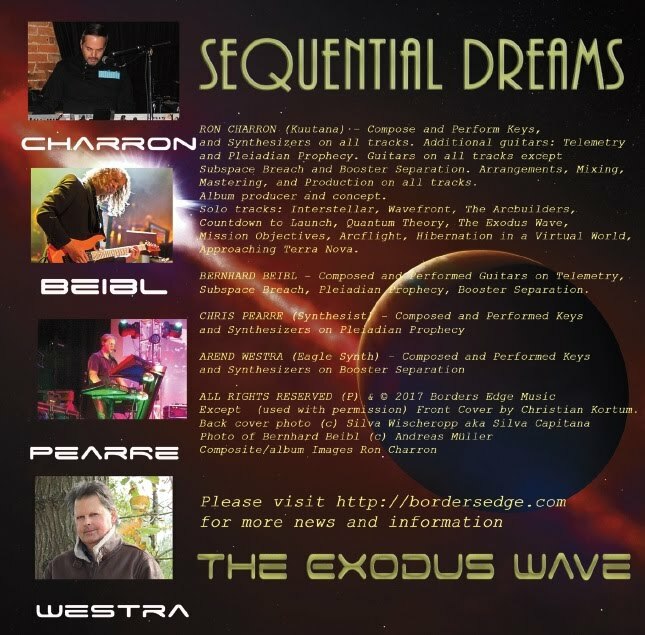 Chris Pearre: Keyboards/Synths on "Pleadian Prophecy"
Arend Westra: Keyboards/Synths on "Booster Separation"
bordersedge.com for more details, reviews, interviews, and information. 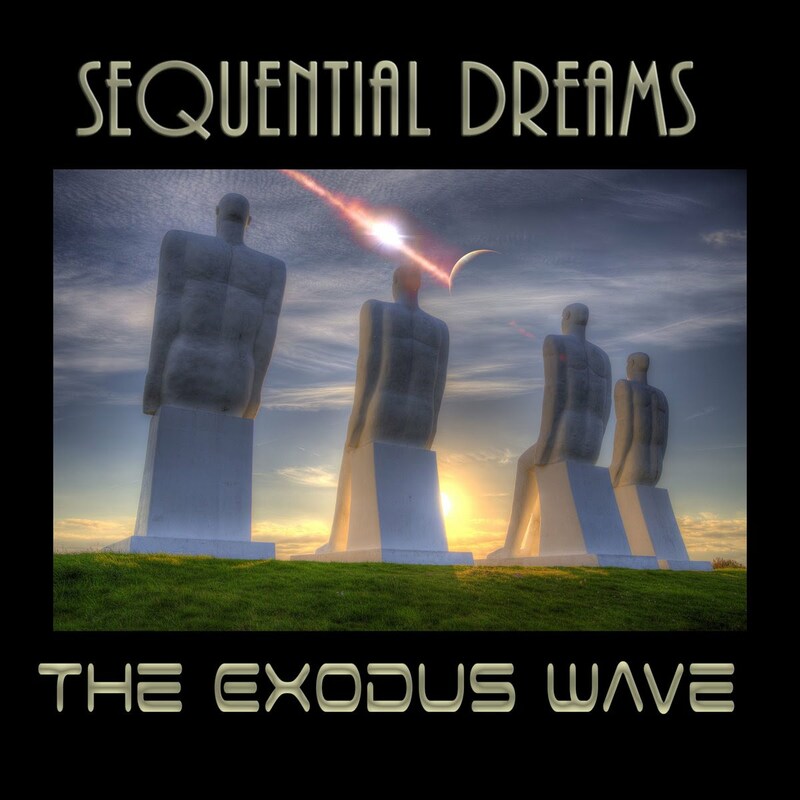 and Synthesizers and Cinematic Electronic Progressive Rock"
The Exodus Wave album is the Sequential Dreams project’s eighth album release. Running at 79 minutes and 14 tracks, this Berlin-School of electronic music inspired instrumental cinematic electronic progressive rock album should appeal to lovers of classic electronic synthesizer sequences, rich ambio-tronic effects, layered melodic and harmonic pads and leads. Add rich guitar riffs and rhythms of former Tangerine Dream guitarist Bernhard Beibl and you’re set for a revival of some of the moods that defined an era and still inspire today. The album also features guests artists Chris Pearre (a.k.a. : Synthesist - California) and Arend Westra (Eagle Synth - Netherlands) for an international cast. 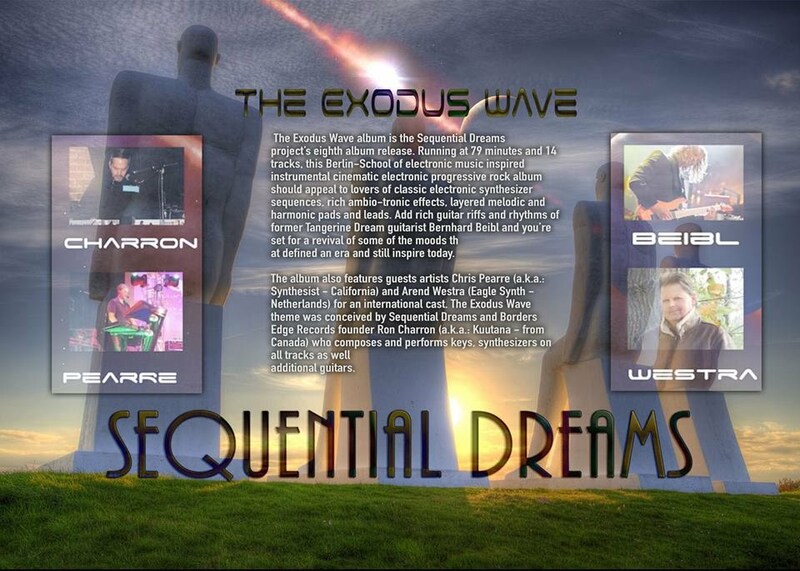 The Exodus Wave theme was conceived by Sequential Dreams and Borders Edge Records founder Ron Charron (a.k.a. 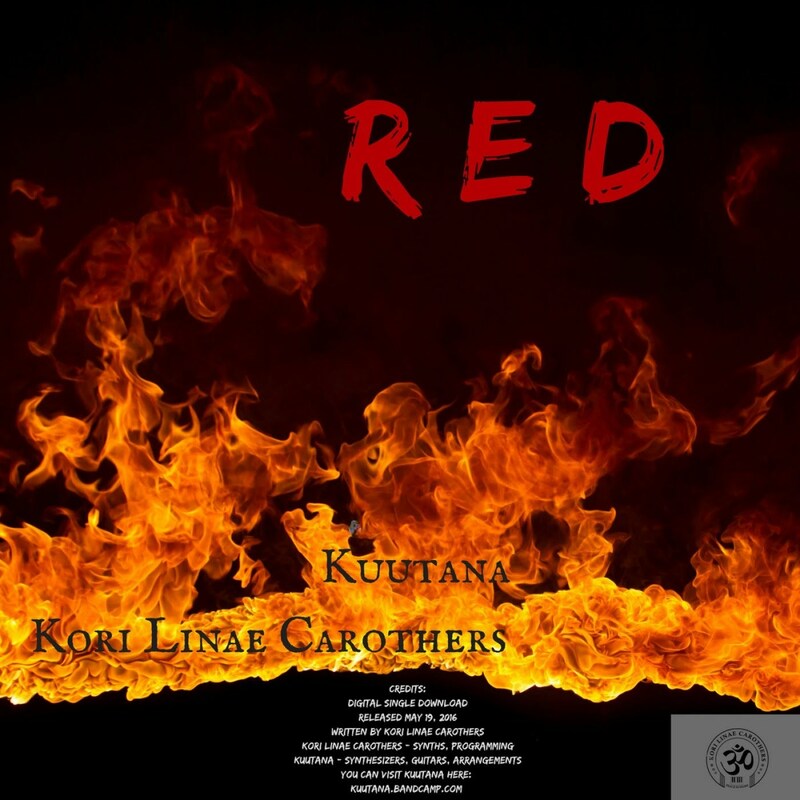 : Kuutana - from Canada) who composes and performs keys, synthesizers on all tracks as well additional guitars. 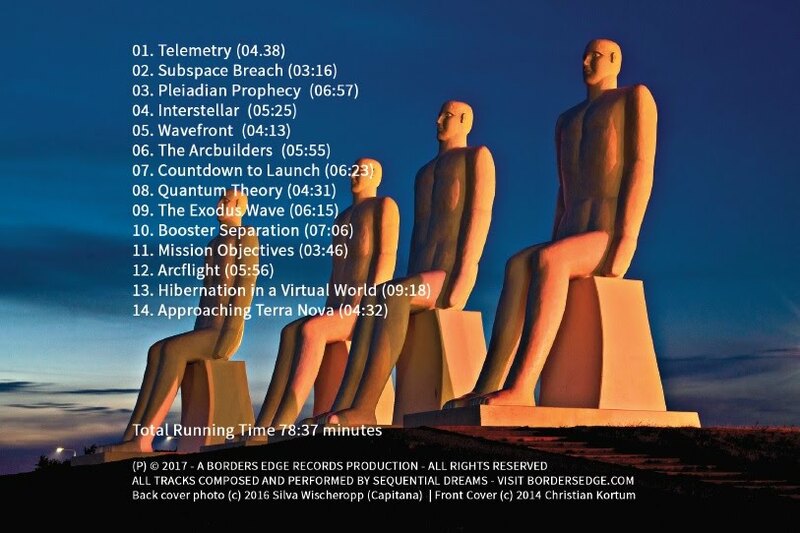 The Exodus album by Sequential Dreams follows a science-fiction theme with the tragic unfolding of events following the detection of an incursion of another universe onto our own, generating an energy wavefront forcing the evacuation of Terra. All is not lost however, as the Arcbuilders build a means to evacuate to Terra Nova, a new planet by way of a new Quantum engine. Perhaps this little story line will help you build your own movie of the mind as you listen through the album. 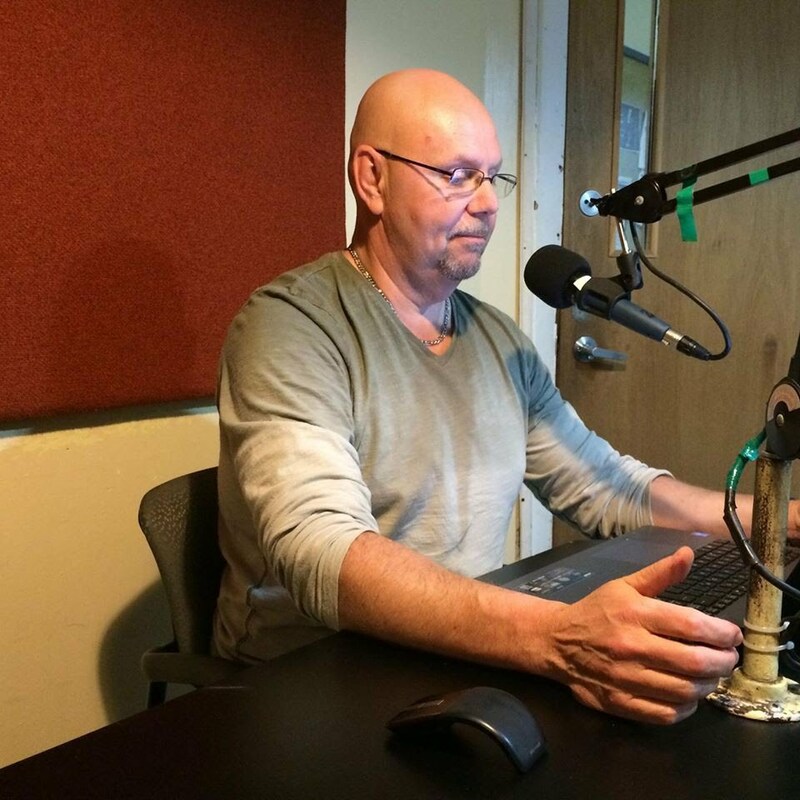 The storyline was ever-present in Ron’s mind as he composed and performed the base of the album tracks. Then, working with featured musicians, the team worked together to build a musical consensus that led to the realisation of this harmonically rich album. 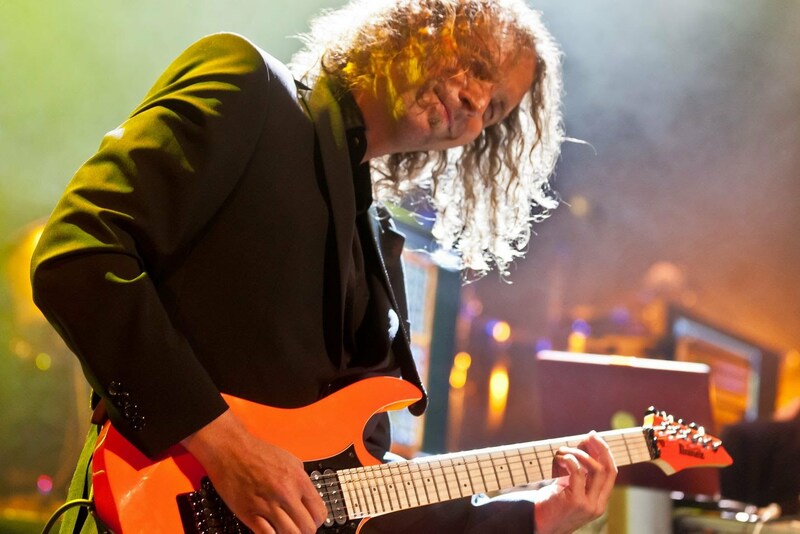 BERNHARD BEIBL (Former Tangerine Dream - Vienna Austria) - Composed and performed guitars on Telemetry, Subspace Breach, Pleiadian Prophecy, and Booster Separation. CHRIS PEARRE (a.k.a. 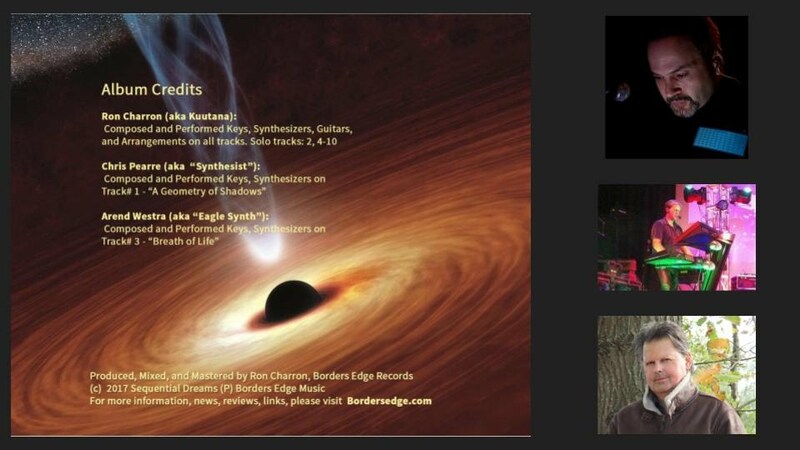 : Synthesist - Composed and Performed keys and synthesizers on Pleiadian Prophecy). 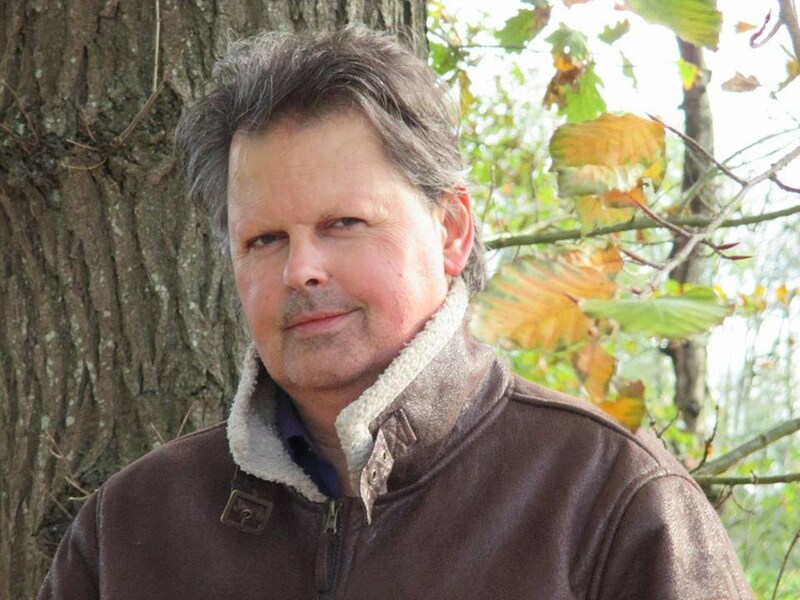 AREND WESTRA (a.k.a. 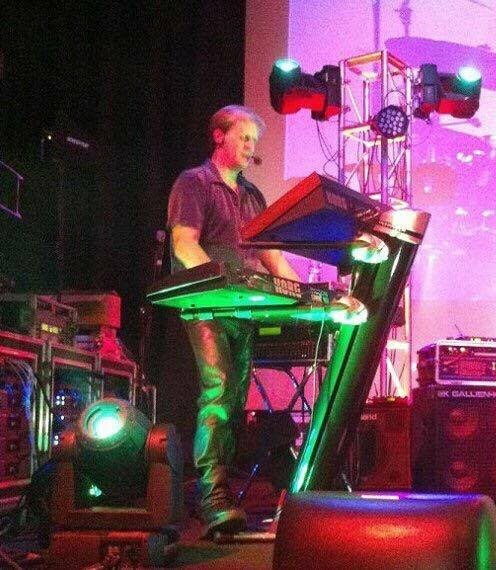 : Eagle Synth - Netherlands) - Composed and performed keys and synthesizers on Booster Separation. RON CHARRON (a.k.a. 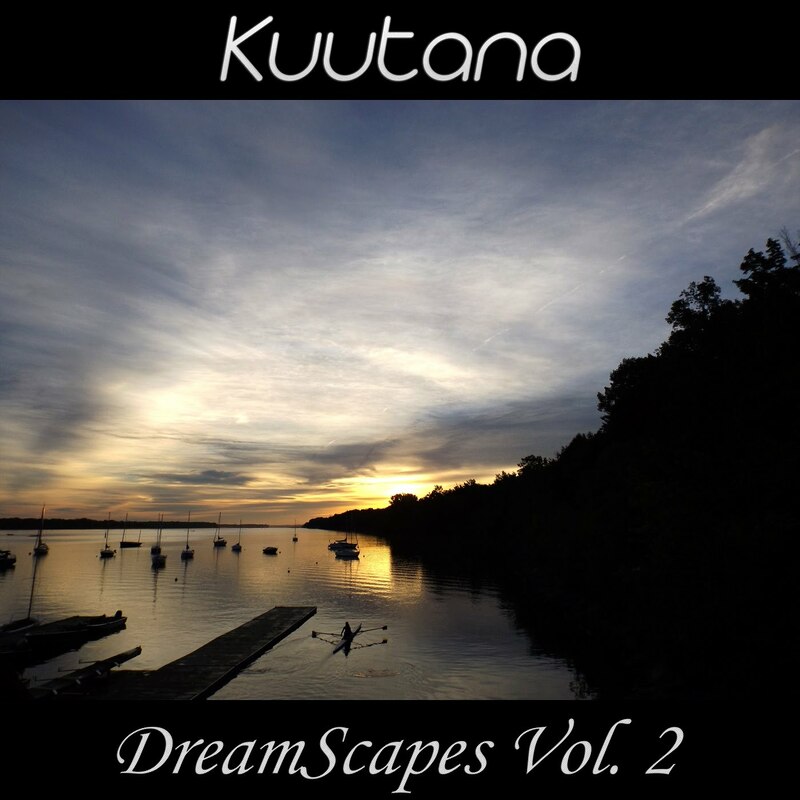 : Kuutana) - Canada based, composed and performed, keys and synthesizers on all tracks. Additional guitars on Telemetry and Pleiadian Prophecy. Guitars on other tracks except Subspace Breach and Booster Separation. Arrangements, Mixing, Mastering, and Production on all tracks. Album producer and concept. 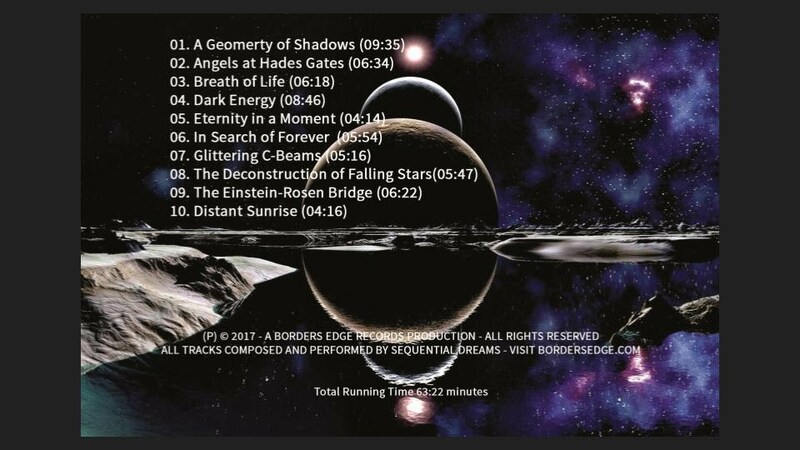 Solo tracks: Interstellar, Wavefront, the Archbuilders, Countdown to Launch, Quantum Theory, The Exodus Wave, Mission Objectives, Arcflight, Hibernation in a Virtual World, and Approaching Terra Nova. A honorable mention to the giants who have provided musical inspiration throughout the years, Paul Haslinger, Peter Baumann, Chris Franke, Klaus Schulze and last but not least, Edgar and Jerome Froese and the many amazingly talented musicians of Tangerine Dream in its many formations. Except (used with permission) Front Cover © 2014 Christian Kortum. Back cover photo (and inspiration for using the ‘Men at Sea’ theme - © 2016 Silva Wischeropp (a.k.a. Silva Capitana - Berlin). 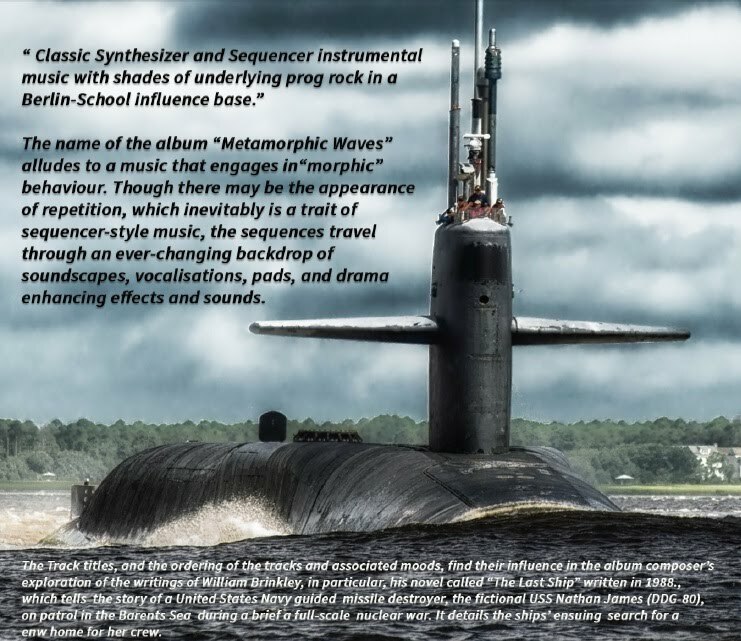 Sylvain Lupari, "Synth & Sequences"
Bandcamp CD Baby Google Play Amazon and many more! Themed after NASA’s “New Horizons” space mission to Pluto and the outer solar system, this second Luna Firma album paints a musical tapestry of soundscapes and melodies to accompany you on your own trip to the far reaches Sol’s reach. 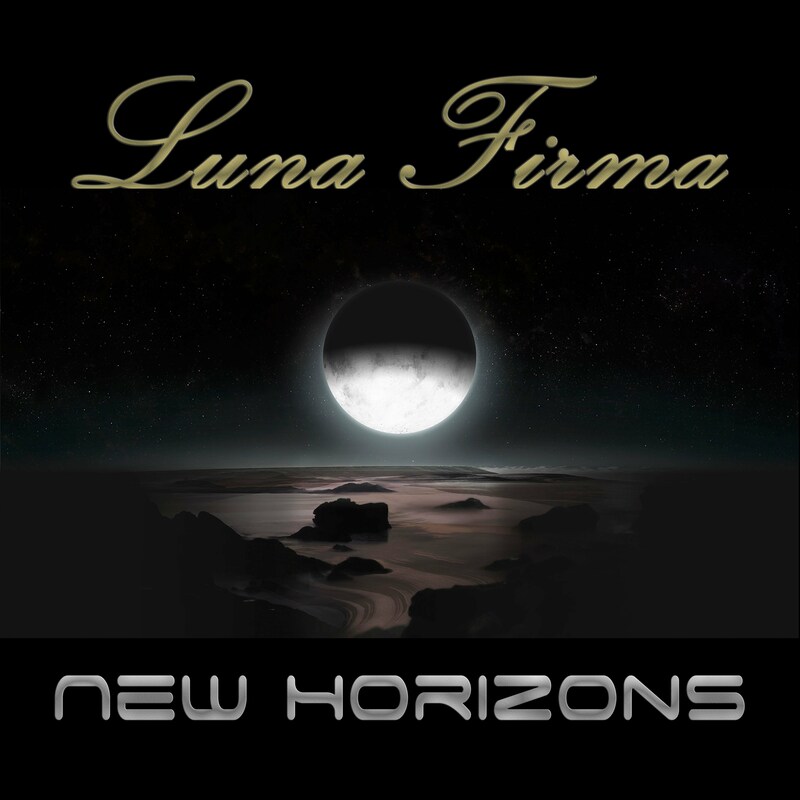 “Swelling harmonic synthesizer melodies evolve slowly over a bed of rich ambient soundscapes” is a fast way to say that “New Horizons” album by Luna Firma was composed with much attention to bringing you, the listener, into a state of exploration along themes of the NASA space mission. Tracks are themed along mission lines and discoveries made during the probe’s amazing journey to Pluto and beyond. This year also saw the introduction of a new album by Vangelis called “Rosetta” - also themed after a NASA mission of that name. If you liked that album you may very well enjoy this latest album by Luna Firma! Album mixed and mastered at Borders Edge Studios, Canada. Like our Facebook Page for upcoming news! “Legends” unfolds like a science fiction thriller full of exciting twists and turns, delivering an exhilarating listening reward of interstellar adventure! Although taken individually, sections of Legends tracks may have a sound familiar to New Age or Ambient music genres, the listener will discover the progressive nature of the composition style as the sections evolve from a setting of gentle mystical beginnings which gradually transition into energetic finales blending rich layers of synthesizer textures and pads, with percussive sequences cut through by masterfully played guitars. To provide moments of relaxation and reverie, some pieces revolve around deeply emotional acoustic piano which bathe in synergistic layers of synthesizers pads and melodies with guitar lines which ebb and flow, following the evolving moods of the compositions. The listener will also be guided through the occasional moment of eastern traditional influences that add little unexpected moments of tribal discovery. 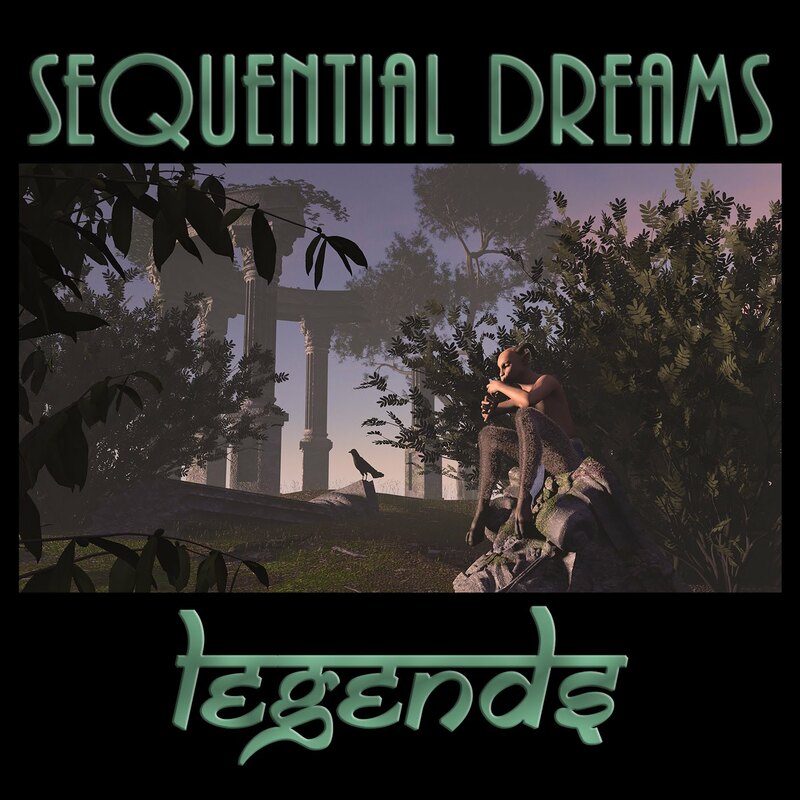 The end result of a dedicated effort to synergistically align the rich musical contributions and influences of talented musicians from the Americas, Europe, and Asia, Sequential Dream’s “Legends” album is a sonic adventure not to be missed! 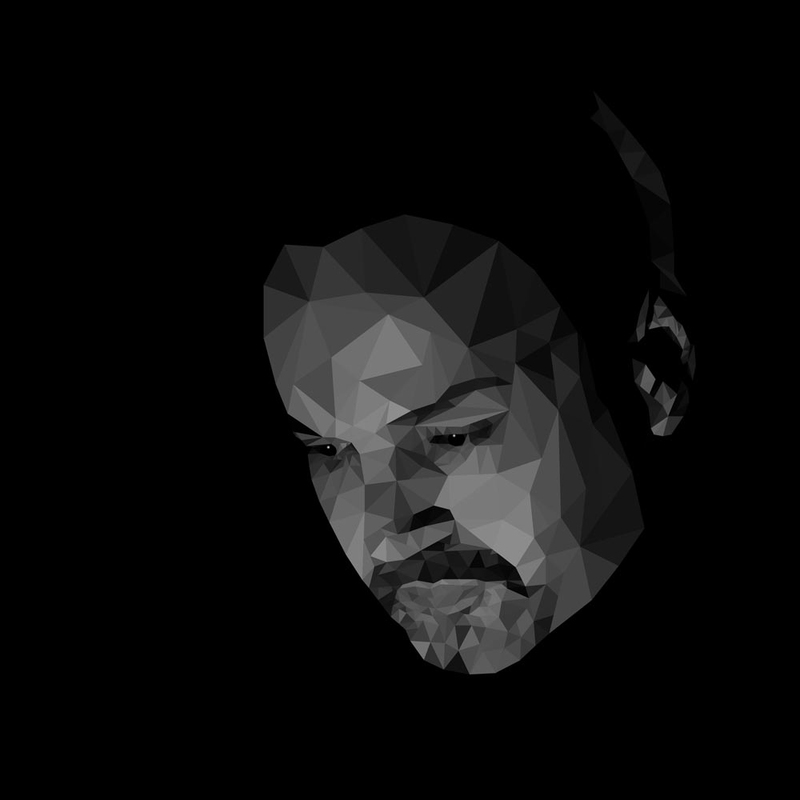 Influences: Ambient and Ambient soundscapes, New Age, Berlin School Electronic Music, and Electronic Rock. 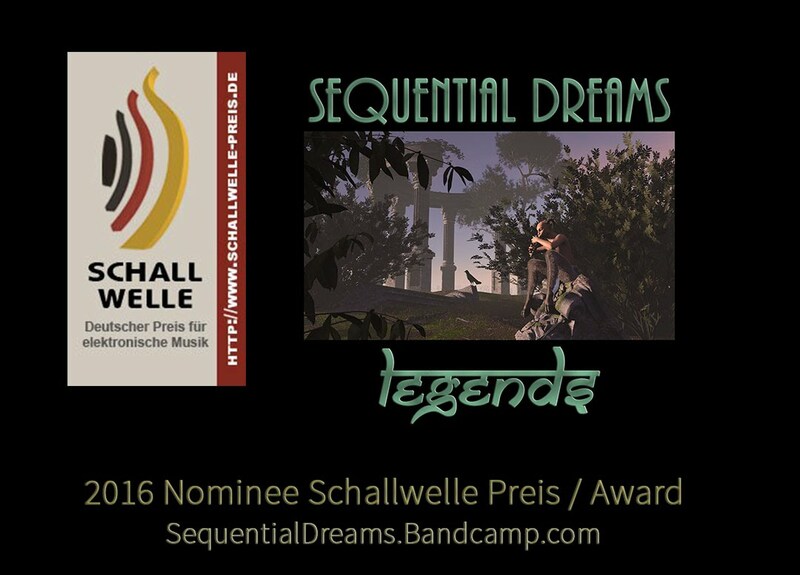 - "An album which crosses easily the limits between electronic rock, New Age and some perfumes of Berlin School from the Tangerine Dream's best years..." from the Synth&Sequences June 2016 review of Sequential Dreams "Legends"
- “Legends” unfolds like a science fiction thriller full of exciting twists and turns, delivering an exhilarating listening reward of interstellar adventure! 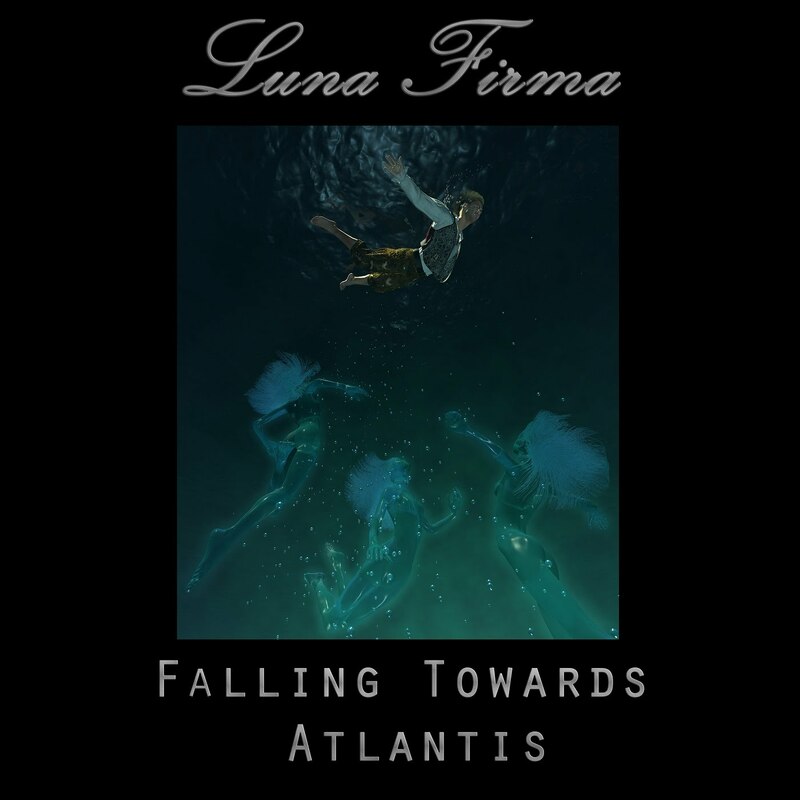 Luna Firma's "Falling Towards Atlantis"
"Falling Towards Atlantis" is Luna Firma's first album. An album featuring gentle soundscapes with music intended as an "audio film" where you can fill-in the images with your imagination. Relaxing, but with a sense of adventure as you gradually find your way to the lost underwater city of Atlantis. All tracks composed and performed by Eric the Taylor, and Kuutana . 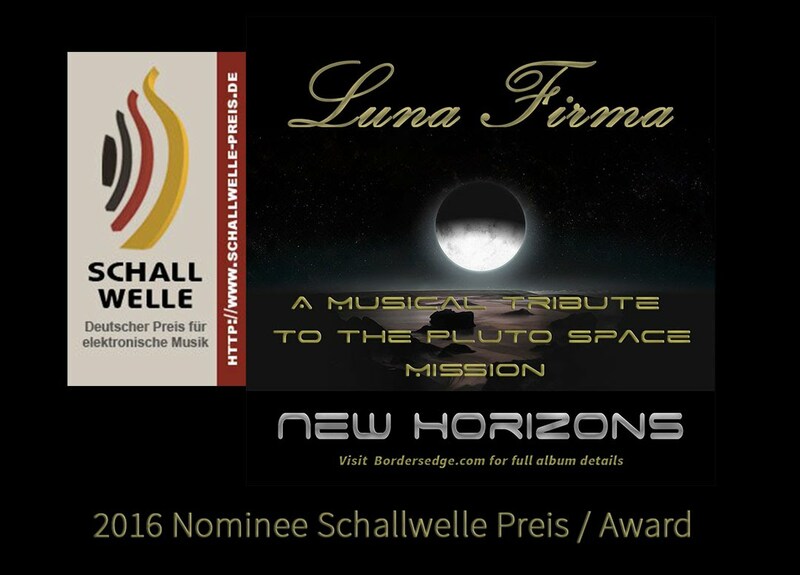 You may also be interested in the follow-up album, "New Horizons"
"... Simply exhilarating ... inescapable to the fans of Tangerine Dream, all periods aimed "
See track information for more details. See also bordersedge.bandcamp.com for compilation albums. The album cover art is titled “Robinson Crusoe 3015” - original digital art by Andreas Schwietzke and used with permission for this album. 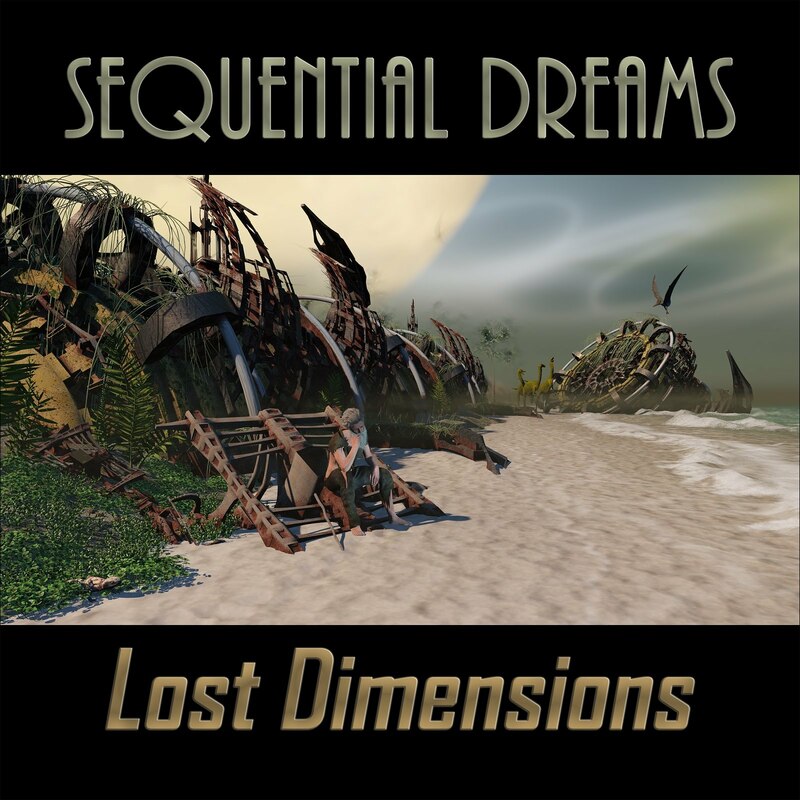 “Lost Dimensions” is Sequential Dreams’ sixth album. The album is inspired by the sci-fi concept of a time traveller that escapes imminent danger to Earth by travelling one thousand years into the future. Most tracks evolve through many stages ranging spacy intros and breaks, progressive synthesizer driven sequences overlaid with multiple layers of evolving melodies and themes making for rich textured soundscapes. 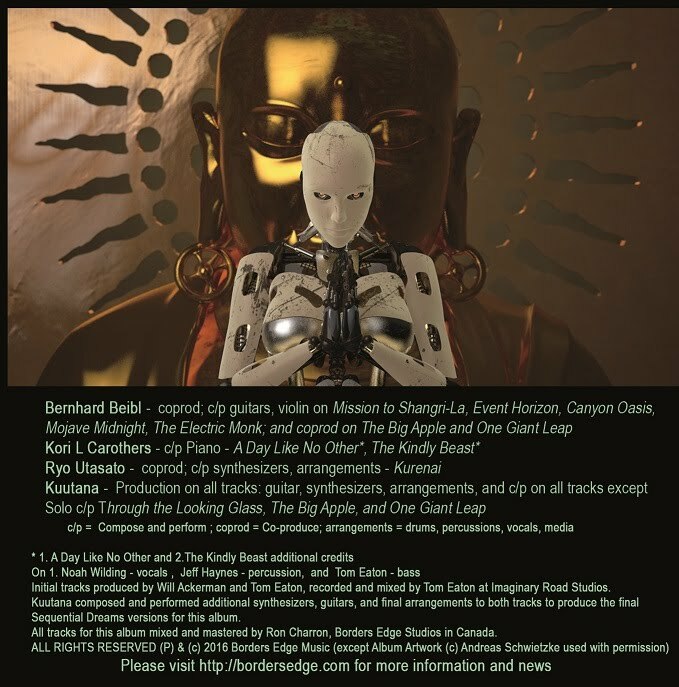 “Lost Dimensions” is a collaborative album with teamwork including contributing artists from Canada, Finland, Ireland, and the USA and is a truly international production. 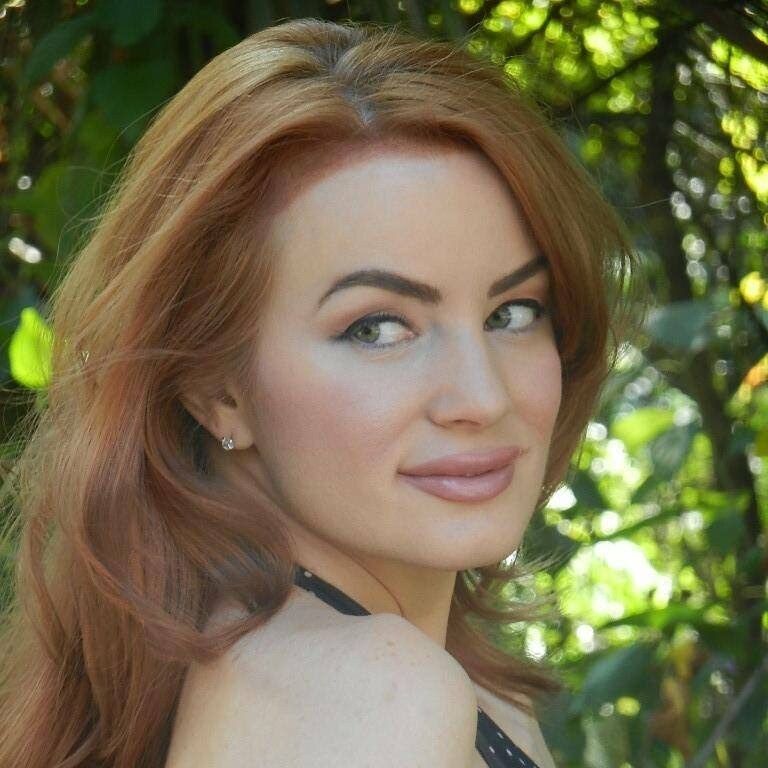 Each contributing artist has released many solo or other collaborative albums under other projects and bring their experience and passion to this album. 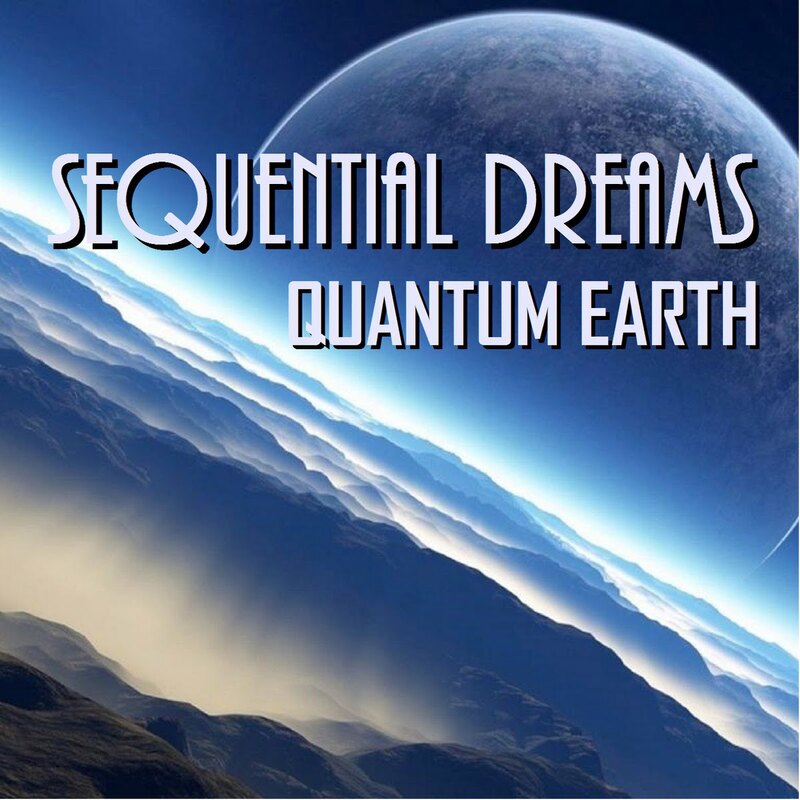 Music from Sequential Dreams and its contributing artists is played regularly on both FM and Web radios worldwide. 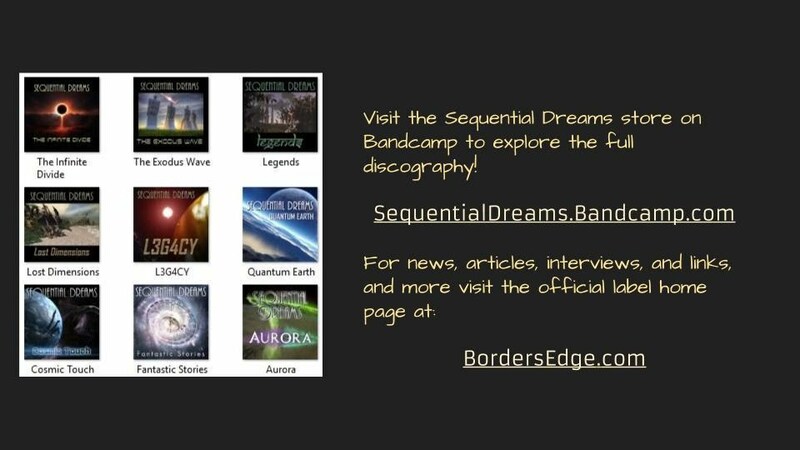 You are invited to visit bordersedge.com for news, or on facebook at www.facebook.com/SequentialDreams or all things Sequential Dreams on this site. Facing imminent disaster here on Earth, a time machine is build to use newly developed applications of quantum teleportation. Preparations are made for a "Journey to the Heart of Time"
As the time traveler's capsule crosses the quantum threshold, a kaleidoscope of dimensions appear. Any change in phase and the capsule could emerge in an unknown dimension. Maintaining quantum phase integrity, the time capsule emerges a thousand years into the future. Earth, a thousand years into the future. Many years after the projected meteor collision that would have decimated most life shortly after embarking on the journey. Communications with an colony settled on Mars led to a local team of Martian archeologists preparing to visit the traveler. Evolution was taken into hand by early Martian colonies. With resources thinning out, the Earthers needed to adapt their physiology to their new home planet. The traveler was amazed to see how much change took place over the course of a millennia. Was he now the sole human being in the Galaxy? 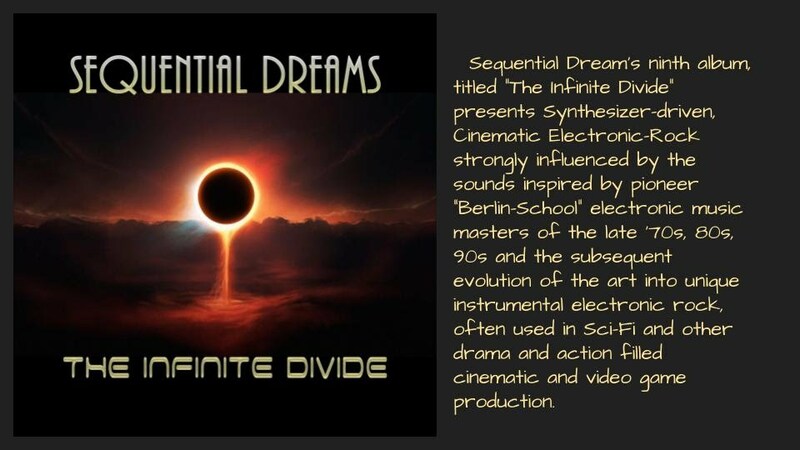 Sequential Dreams would like to highlight the important contributions to the Berlin School genre of music made by the late Tangerine Dream co-founder, Edgar Froese. Though you are no longer with us in flesh, your soul continues on in your musical legacy. 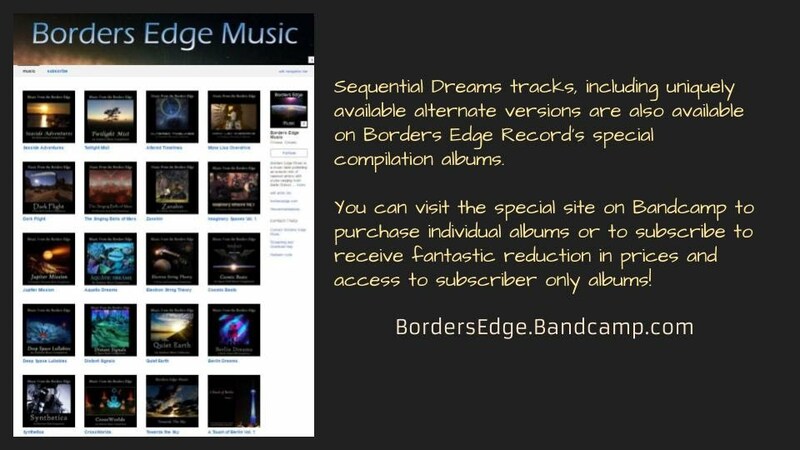 Sequential Dreams and Borders Edge Records have no claim of ownership to Tangerine Dream and the name is used for information purposes only so to illustrate the type of music played. 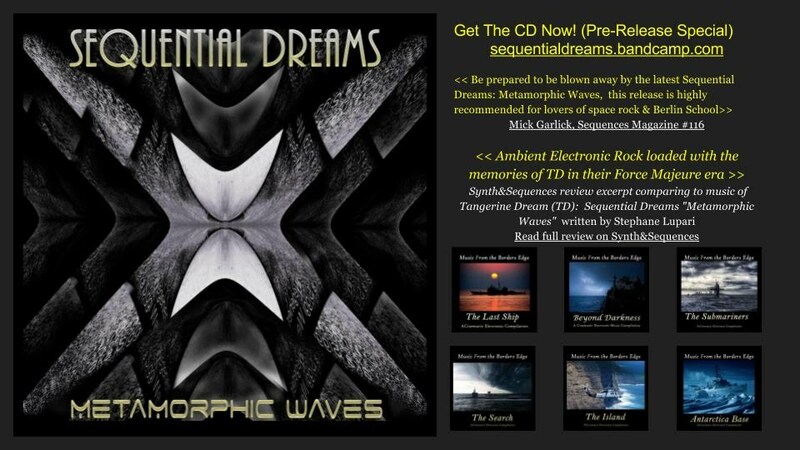 Fans of Tangerine Dream should visit http://www.tangerinedream-music.com to learn more. 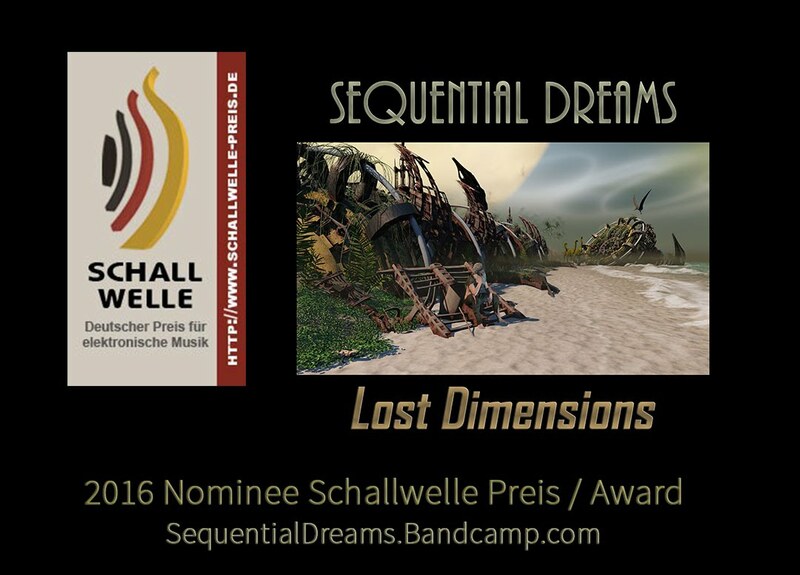 All content on the Sequential Dreams - Lost Dimension is from original compositions by the album authors. No samples of TD material or scores were used in the making. "... this collection epitomizes ambient music at its best. Sophisticated sounds, movement without intrusion, and the kind of music one could easily dream into ..."